Elephant ears are in the Aroid family. Most all plants that we think of as Elephant ears are either Alocasias, Colocasias, or Xanthosomas. 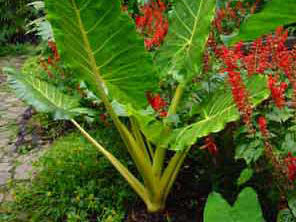 The classic “Elephant Ear” is Colocasia esculenta. Most Colocasias are similar with big, floppy leaves that hand pointing down toward the ground. Alocasias are usually the kind of elephant ears that are very erect with stiff leaves that point upward. At least the ones I like, do. Here are some of my favorites. It has become impossible to collect them all, every year I see new forms and varieties. Alocasia lutea –Yellow Stem Elephant ear – Bright yellow stems with gigantic leaves, what’s not to love about this plant!? I grew this plant for years but lost it in a very cold winter and haven’t found another one yet. One of my favorites.